Comments Off on Babakota, the Indri. The worlds’ largest lemur. 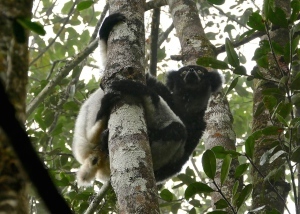 Babakota, the Indri. The worlds’ largest lemur. The forest was quiet as we walked quietly through the light rain, the drips on the pathway forming little puddles of liquid crystal reflecting the trees around us. The Birds’Nest ferns clung to the straight boles that towered up and away into the green layers above us. We admired a row of bracket fungi that had grown progressively along the angled tree trunk across the path. A tree frog squeaked anonymously to our left……impossible to trace. We crossed a stream on a wooden bridge, the clear water flow steady and shallow. Some sounds emanated briefly from the canopy on our right and the guide stood still for a moment his eyes scanning high in the trees. He pointed. 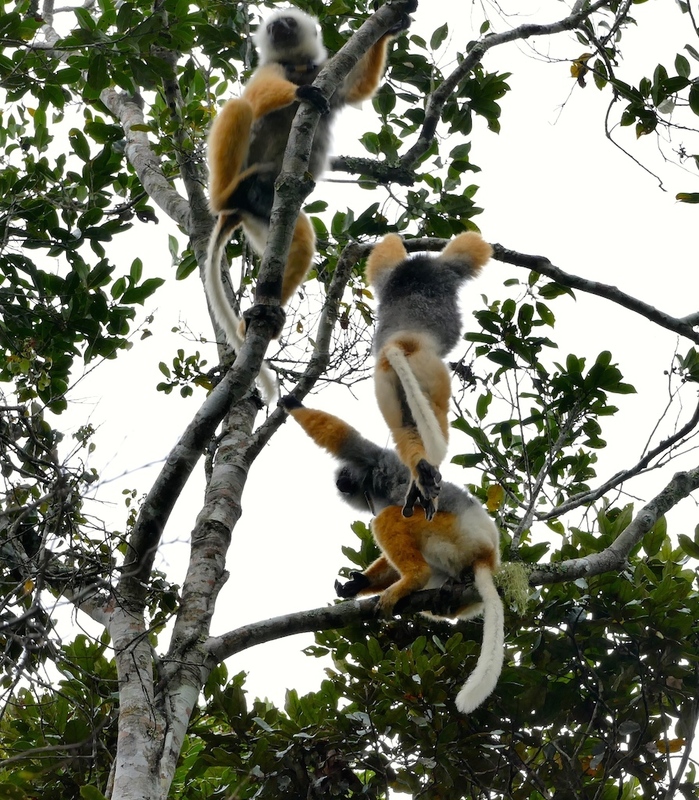 We shuffled around trying to get a better view….and a trio of Black and White ruffed lemurs came into sight high in the uppermost branches of a fig. They swung under the branches of a fig, carefully plucking the ripe fruit with a strong hand, whilst gripping the branches with their feet and other hand. Clearly no fear of heights! Their golden eyes peered down at us briefly, and finding nothing alarming ignored us and continued feeding. They were lovely, and their thick woolly white and black coats were speckled delicately with the rain. We watched them for about 15 minutes before reluctantly moving on. Our first Black & White ruffed lemur. A Cuckoo roller was flying high over the forest, the ringing song so distinctive in the morning air. Then, far away to our left a series of loud cries echo’ed through the morning. 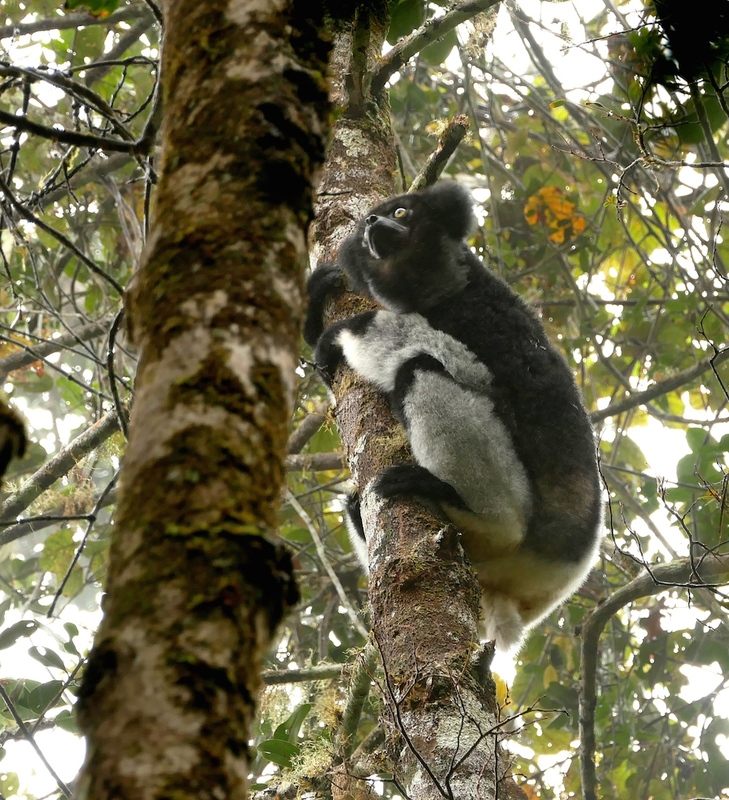 These were Indri making their morning territorial calls. Their were definitely two different tones to the calls….the high pitched one was the female, the guide told us. We took a right fork in the path, away from the steep ridges, along the stream, and eventually we crossed over it. I glimpsed a pair of Meller’s ducks shyly slipping away from beneath the shelter of a tree that had fallen across the river, providing a dark hide-away. They sped away and were lost to my binoculars. The guide motioned to us to wait a moment for him as he wanted to sprint up a nearby ridge and check a different section. The three of us stood quietly, each of us watching and listening. For what we weren’t sure, but it seemed the right thing to do……..a cathedral air, for sure. The next moment, from about thirty yards behind us, a series of ear-splitting whoops and and shrill cries exploded in the forest! We stood stock still for a moment, and then I grabbed Steve and Camille and rushed them up the steep pathway towards the sound. 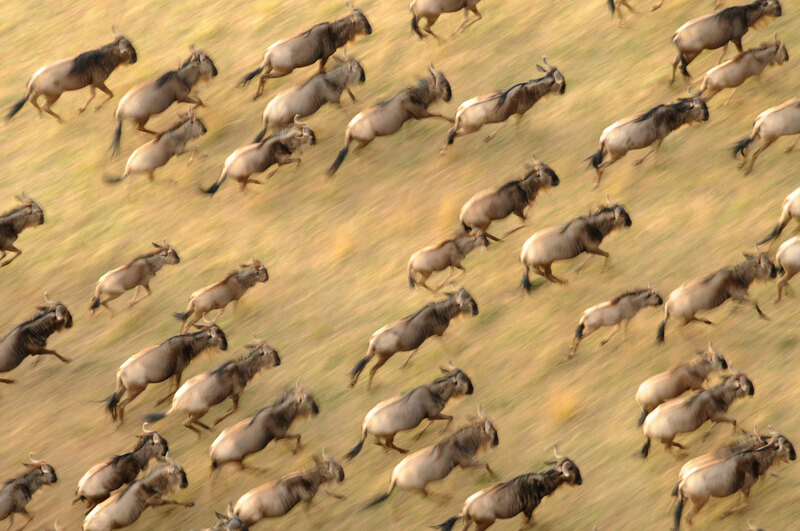 I bounded up the hill, and looked back to see how far behind my guests were….”Come on, come on,” I urged them. 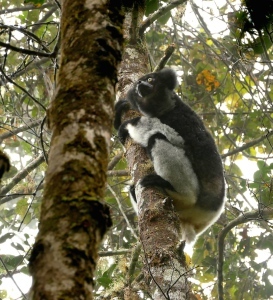 The indri family consisted of a dominant male, and female, and an assortment of sub-adults and a baby still clinging to its’ mothers thick fur. The Indri is the most vocal and largest of all lemurs. 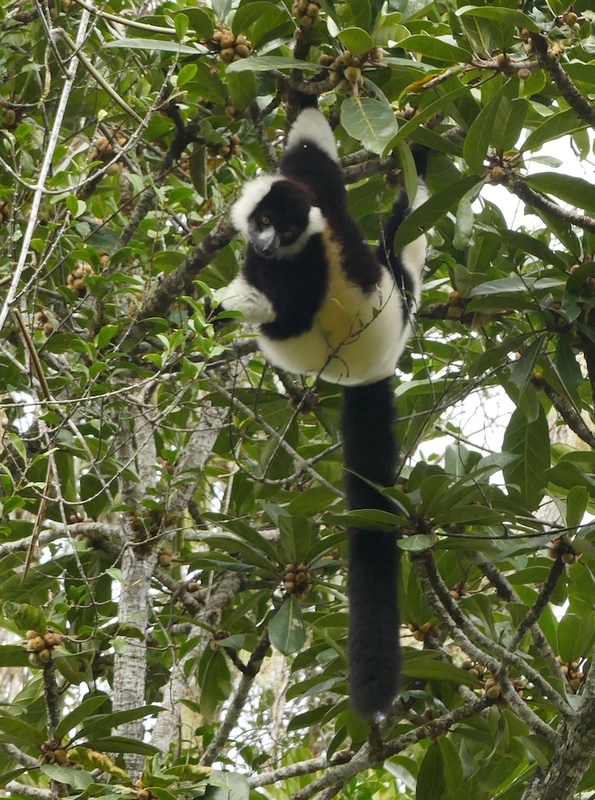 Indri like most large lemurs jump from upright branch to upright branch. It was difficult to get a clear sight of them as the glare of the bright sky made silhouettes out of their teddy-bear bodies and ears. They were quite relaxed with us, so far below them, and periodically one or two would bound effortlessly from up-right branch to branch, and pluck some leaves from a leafy bough to eat. I waited for them to call again, in answer to other groups calling in the distance, but they wouldn’t. We stumbled around on a steep slope, ankles bound by the forest floor flora, trying the get better views of them. Eventually we left them and carried on, the cries of distant Indri still wafting through the cloud cushioned canopies far away from us. We did find another group towards the end of the morning, and there was another two groups of guests already competing for space below the family because there was a tiny baby clutching its mother across her belly, and of course it was a big attraction. 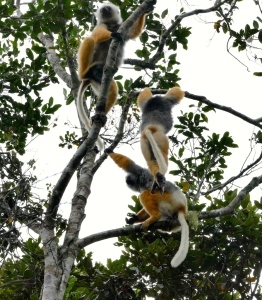 A playful trio of sifaka. We moved on and watched a small group of Diademed sifaka instead. One of them was collared and they sat feeding quietly, just a short distance above us. Then after a few minutes of stuffing leaves into their mouths, it was playtime and they jumped around chasing each other, then settled on a branch where it was time to groom each other. Note the one individual swinging calmly by his hands, feet crossed comfortably! 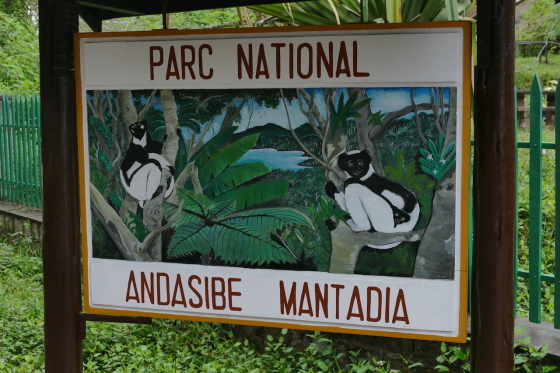 ← Mantadia Andasibe Reserves….after running the gauntlet on the main road.